One of the most important forms of worship in Hinduism is the worship of goddess Mother as Ambigai, Shakthi or Devi. This is the most ancient form of worship before men became knowledgeable in other things. It was the worship that was prevalent throughout the world. Before the advent of western civilization, the westerners offered their prayers to goddess Freia. The ancient Egyptians offered their prayers to Isis, a goddess of magical power and divine blessings. The roman and the Greeks too had worshipped goddesses such as Hera, Juno, Diana and Venus. In the Far East countries such as China and Japan, people workshipped goddesses like Kwan Yin and Amaterasu. Even in countries like Malaya and Indonesia devotees workshipped goddess Chandi. into a variety sub sects. Later it came under the six codified system of Hinduism as devised by Adi Shankara. Subsequently it began to be incorporated into both Saivaism and Vaishnvism. The worship of Kali is also ancient in practice. 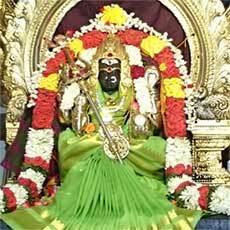 The Tamils of yester years had offered their prayers to her as Kaadukizhal, Pazhayol, Moothozh and Kottravai. After the Sangam period, she was also worshipped, among others, in the form as Iyai, Nisumbasoothini and Chamundi. Nisumbasoothini became the kula devatha for the Tamil rulers. Sri Devi Mahathmiyam is a book that contains seven hundred mantras and three historical parts. The three parts talk about the killing of Madhukadipa, Mahishasura and Sumbanisumba respectively. During the killing of Nisumba, Kali appears as one who killed the three asuras(demons), namely Chandan, Mundan and Rakhthapeejan. The oldest temples found today in Tamilnadu are dedicated to this particular form of Kali known as Nisumbasoothini(the one who killed Nisumba). there are also other forms of Kali such as Adhya Kali, Maha Kali and Dasamukhi. Badrakali or pathirakali as she is known here at this temple represents all that is auspicious. The meaning of the word badra or pathira is bliss, peace and auspiciousness. However at present the word BadraKali or Pathirakali has gained the opposite meaning. The MahaKali at Ujjani, north India, is one of the oldest form of Badrakali. This is the city of Vikramadhitya the great king whom the folklore associates with the worship of Sakthi. The city is also known as the birthplace of Kalidasa the greatest Sanskrit poet and author of Sakunthalam, Megasandhesam and other works. Mother Kali's appearance is very natural and one need not have fear or apathy towards her appearance. We should offer prayers to her as the epitome of peace, tranquility and auspiciousness. That's how Swami Ramakrishna and his disciple Vivekanada worshipped her. We should remind ourselves the true meaning of Pathira Kali - she is the Blissful One, the Auspicious One who at this temple resides as the main deity.